Lowepro builds protective, high-quality bags and gear for photography, video, and portable electronic devices – for every climate and every condition. We are inventors, designers, photographers and lovers of the natural world who take our reputation as The Trusted Original™ to heart. We also are travelers, hikers, cyclists, rock climbers, runners, surfers, skiers, kayakers, and snowboarders. And our design team is passionate, curious and disciplined—they put incredible energy and imagination into building and testing products. We strongly believe that we owe it to ourselves and to our industry to do whatever we possibly can to protect and save the environment. We support photographers, videographers, and organizations that promote conservation and restoration. 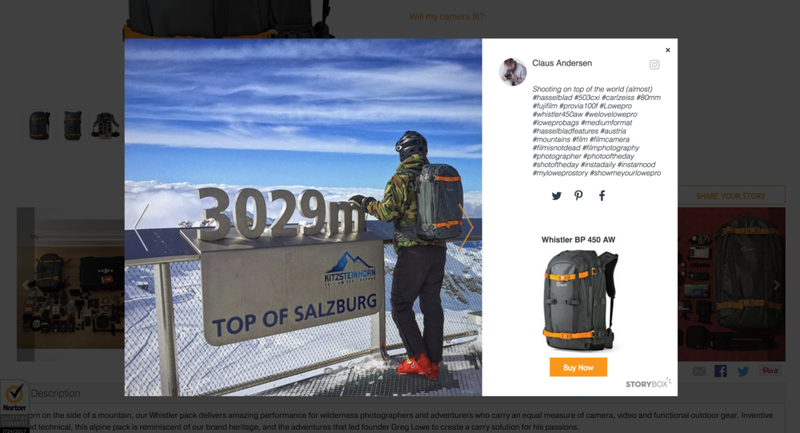 LowePro puts their customers front and center - when you go to their homepage, LowePro proudly displays the members of their community there. Website visitors can see the epic photos that LowePro customers are taking, and the incredible locations where they're bringing LowePros products. LowePro features StoryBox's StorySlide Display Module on their homepage. This allows website visitors to start to explore the LowePro community in addition to the LowePro products. Each lightbox displays not only the customers photo or video, but it also shows what customer posted it, what they said, as well as the option to purchase the item shown in the customer's photo. In addition to using #LoweProStory, LowePro also allows customers to submit photos and videos directly on the LowePro.com website. On each and every Product Detail Page, LowePro displays photos of real customers using (and LOVING) their products. This is the most powerful way to show social proof at the point of purchase, and to drive more sales by featuring your satisfied customers. LowePro displays customer photos and videos on each Product Detail Page using StoryBox's StoryReel. Only customer photos related to the product on this page are shown.